A warm and open invitation to join the next #creativeHEmeetup on the 16th of March! #creativeHE is an open collaborative community for creative and innovative practitioners which exists online at https://plus.google.com/communities/110898703741307769041 through which a series of events and courses have been offered by the Centre for Excellence in Learning and Teaching at Manchester Metropolitan University in partnership with Creative Academic and facilitators from a range of institutions nationally and internationally. We will continue connecting, collaborating, experimenting and learning together online this year and have just launched the Creativity in Practice project led by Prof. Norman Jackson. This academic year, we have introduced meetups in the North-West in collaboration with the University of Salford and the University of Manchester. Our next meetup will take place at Manchester Metropolitan University on the 16th of March, 12-2pm in the John Dalton Building E249 on Oxford Road. The focus of this meetup is the creative use social media. Please bring your ideas along to share them with a wider audience. Staff, students and the wider public, all very welcome. For more information and to register, please access http://www.celt.mmu.ac.uk/community/creativehe.php We are very much looking forward to seeing you there. It aims to support pedagogical rebels and free-thinking innovators in experimenting with, developing, sharing and getting support for novel learning and teaching ideas as well as initiate and disseminate research activity around these that have the power to transform the student and staff experience within and beyond institutional boundaries. We meet physically on a monthly basis, each time at a different institution. During our meetups, we will have the opportunity to get to know each other, share and grow new ideas, take risks and support each other in our creative adventures, experiment and play, as well as test and develop pedagogical ideas and identify ways to take them forward. We suggest that each meetup features time for socialising. As the meetups will all be free and open, we encourage each participant to bring a gift of food and/or non-alcoholic drinks to share with other participants. Homemade and more healthy contributions are very welcome as are foods from different cultures. In this simple way we aim to encourage sharing of the many cultures that make up our society. The institutional contact will coordinate the monthly gathering and a booking system will be in place through CELT at Manchester Metropolitan University. If you would like to become a #creativeHE champion in your institution, please get in touch with us. This time we discussed the creative use of social media for learning and teaching. This topic emerged directly through conversations we had during a previous meetup and I think it is a wonderful way to come-up with a focus instead of randomly picking one. It was a smaller group this time but the conversations and sharing were deep. A colleague from Bournemouth university joined us and engaged us in a series that of drawing activities based on her doctorate real research. While these were low tech, we did make the connection to social media and how we could use these as well to add a digital dimension to create alternative and additional opportunities for expression, sharing and collaborative drawing. 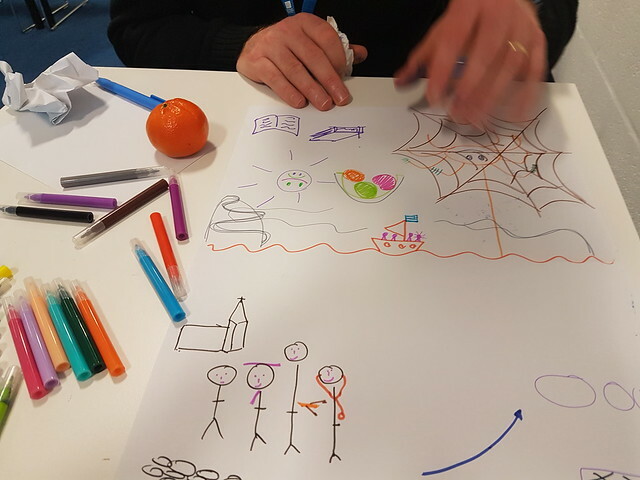 We could see parallels to the use of LEGO SERIOUS PLAY but also differences and agreed that drawing is a valuable tool in our toolkit that can be interwoven into classroom practice, in and outside the classroom, in the physical and online classroom. Our next meetup is in May at the University of Salford. This entry was posted in CreativeHE, Uncategorized and tagged #creativeHE meetup, #creativeHEmeetup, CreativeHE by Chrissi Nerantzi. Bookmark the permalink.